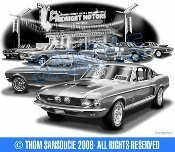 GREAT COLOR PRINT 18 X 24 OF THE CLASSIC GT500 SHELBY MUSTANG NEW AND OLD ! BRILLIANT COLORS HAND SIGNED BY ARTIST. 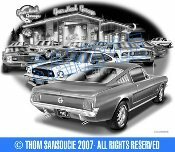 GREAT BLACK AND WHITE PRINT 11 X 17 OF THE VERY CLASSIC 1965 MUSTANG FASTBACK. 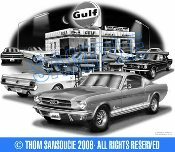 GREAT BLACK AND WHITE PRINT 11 X 17 OF THE CLASSIC 1965 MUSTANG FASTBACK AT OLD GULF SERVICE STATION. 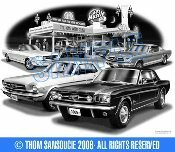 GREAT BLACK AND WHITE PRINT 11 X 17 OF THE CLASSIC 1965 MUSTANG COUPE, CONVERTABLE, AND FASTBACK CARS AT GAS STATION. 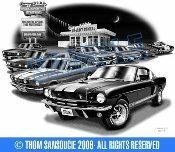 GREAT BLACK AND WHITE PRINT 11 X 17 OF THE FAMOUS 1966 GT350 SHELBY MUSTANG AT LAST CHANCE GAS STATION. 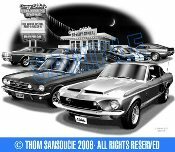 GREAT BLACK AND WHITE PRINT 11 X 17 OF THE FAMOUS 1966 GT350H HERTZ RENTAL CAR AT CRAZY EDDIES SPEEDY RENTAL. 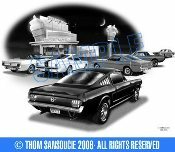 EXCELLANT BLACK AND WHITE PRINT 11 X 17 OF THE CLASSIC 1966 MUSTANG GT CONVERTABLE. 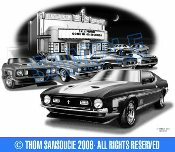 A MUST FOR EVERY COLLECTOR. 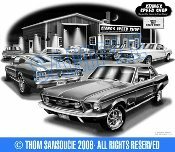 GREAT BLACK AND WHITE PRINT 11 X 17 OF THE CLASSIC MUSCLE CAR 1967 GT350 SHELBY MUSTANG. 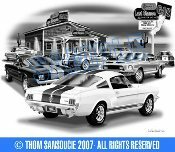 EXCELLANT DETAILED BLACK AND WHITE PRINT 11 X 17 OF THE GREAT MUSCLE CAR 1968 GT350 SHELBY. 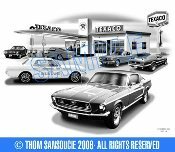 GREAT BLACK AND WHITE PRINT 11 X 17 OF A CLASSIC 1968 MUSTANG FASTBACK AT VINTAGE TEXACO STATION. 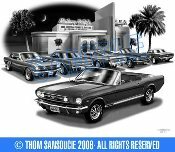 BEST AVAILABLE ! 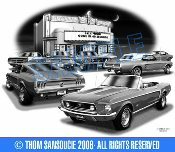 GREAT BLACK AND WHITE PRINT 11 X 17 OF THE CLASSIC 1968 MUSTANG GT CONVERTABLE WITH OTHER 1968 MUSTANGS. 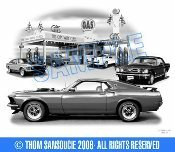 GREAT BLACK AND WHITE PRINT 11 X 17 OF THE 60'S MUSCLE CAR 1970 MACH1 MUSTANG. 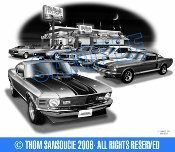 GREAT BLACK AND WHITE PRINT 11 X 17 OF THE CLASSIC 1971 MACH1 MUSTANG.